LAKE BUENA VISTA, Fla. -- Walt Disney World Resort will welcome the millennium with a 15-month celebration that marks this momentous turn of the calendar with grand spectacles, breathtaking new entertainment, breakthrough technologies and sights, sounds and tastes from around the globe. From Oct. 1, 1999 through Jan. 1, 2001, guests can come together and commemorate the millennium at a Walt Disney World celebration centered at Epcot. Amid the magic and wonder of Walt Disney World Resort, they will create memories to last a lifetime. The spectacle will take the theme "Celebrate the Future Hand in Hand." "Walt Disney once referred to Epcot as a 'living blueprint of the future,' " said Al Weiss, president of Walt Disney World Resort. "And it is in that spirit that we welcome the world to celebrate the millennium at this, our discovery park." In true Disney fashion, a spectacular line-up of daily entertainment -- including an opening ceremony for the new millennium filled with larger-than-life figures and adorned in vibrant colors -- will dazzle guests of all ages. Soaring some 20 feet above performers dressed in elaborate costumes, these enormous figures (more than 120) whimsically represent all regions of the world. To the sounds of an original musical score, the puppet-like figures will join 16 gigantic percussion units, designed to resemble colossal timepieces, for a moving spectacle, "Tapestry of Nations." A global party follows as cultures from around the world join together for an unparalleled extravaganza. This street festival will be performed twice daily and will march past the global pavilions of World Showcase. 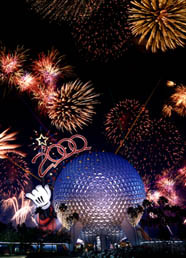 For the millennium celebration, Epcot is introducing "IllumiNations 2000: Reflections of Earth," an all-new nighttime spectacular filled with the fiery glow of torches, a high-energy soundtrack, sky-piercing lasers and thunderous fireworks. More than a simple update, the show has been created from scratch, with more than 30 percent more fireworks than any prior Epcot show. The skies above World Showcase Lagoon will transform into a kaleidoscope of colorful pyrotechnic bursts. Comets will streak across the sky as video images displayed across a giant sphere tell Earth's incredible tale. Then, the sphere blossoms like a flower, exposing a brilliant ball of fire and setting up the show's emotional finale. Dreams of hope for a better tomorrow are cast as the music soars, lasers shoot skyward, fireworks illuminate the night and flames leap across the surface of the lagoon. This breathtaking new show will be presented nightly during the millennium celebration. The millennium celebration will invite countries and companies from around the world to gather at Epcot to showcase their contributions to the new millennium. Dozens of nations and international presenters will take part in the multicultural festivities at Millennium Village, an all-new World Showcase pavilion opening as part of the celebration. Upon entering the attraction, guests will become immersed in a collection of exotic smells, sights and sounds from this exciting "new world." Within its borders are no borders, making it easy for guests to wander freely and discover its rich content including exhibits from more than 35 countries, the United Nations and World Bank. Guests will journey through a Brazilian rainforest, experience first hand the four seasons of Sweden and meet artisans from across the globe. At the front of the park, Future World will welcome Epcot guests to the milestone event. With themes of science and technology providing inspiration, Future World guests quickly become immersed in this interactive festival. The adventure threads throughout Future World with novel exhibits and activities which celebrate today, the greatest technological age the world has ever known. In preparation for the new millennium, Disney Imagineers have completely reinvented Innoventions, where guests preview the future of technology today in a showcase of the latest products for the home, work and play. Guests also can literally leave their mark as a lasting memory of their millennium visit at Leave a Legacy. Etched on a limited edition commemorative metallic tile, their photo is then mounted on one of 30 sculptured granite monoliths near Spaceship Earth. Reminiscent of other world-class celebrations, such as the Olympics, guests can interact with other guests and Disney cast members through pin-trading. Guests can purchase pins at several Walt Disney World locations, including inside each of the four major theme parks and Downtown Disney, or choose to trade pins they’ve brought from home. Limited edition pins will be offered as part of a variety of Walt Disney World vacation packages. 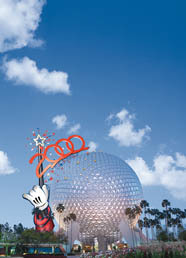 For the occasion, Epcot’s Spaceship Earth will be topped off with giant, glittering "2000" numerals. Soaring from a star-topped wand held by Sorcerer Mickey's unmistakable gloved hand, the whimsical symbol will offer guests a larger-than-life welcome. "With the international cultures of World Showcase and the technological attractions of Future World, Epcot is the natural setting for an event that draws together all mankind in a celebration of what lies ahead," Weiss said. "As we move toward the new millennium, Epcot will highlight those things which make our cultures unique and those things that bind humanity. Walt Disney World will be a place where our guests can celebrate this moment in time in a spirit of fun and also discover the exciting breakthroughs that lie ahead." Location: Focus is Epcot at the Walt Disney World Resort in Lake Buena Vista, Fla.
Theme: "Celebrate the Future Hand in Hand"
Entertainment: Tapestry of Nations More than 120 puppets, 32 drummers aboard 16 rolling percussion stages and 768 total drums in a twice-daily pageant around World Showcase Lagoon. "IllumiNations 2000: Reflections of Earth" A nighttime spectacular on and above World Showcase Lagoon. Earth Globe is the world's first spherical video display system, wrapped in 15,000 LEDs (Light-Emitting Diodes). 2,800 shells for each show - more than twice the number ever used in previous productions. A fountain barge pumps 5,000 gallons of water per minute. A 150,000-pound inferno barge uses 37 nozzles to shoot propane flames skyward. A full color spectrum of lasers, including four custom Disney colors (lagoon blue, mint green, pumpkin orange and lavender). Walls of flames and a giant torch climb 40 feet above World Showcase Lagoon. Other Events: Millennium Village (in World Showcase) Hundreds of entertainers, artisans and storytellers at a 65,000-square-foot world showplace. The United Nations and more than two dozen countries participating. Innoventions (in Future World) Companies such as Motorola, Honeywell, IBM and AT&T will exhibit. Leave a Legacy (in Future World) 30 sculptured granite monoliths will accommodate nearly 750,000 images of guests etched on metallic tiles. Located at the Epcot entrance plaza. Trading pins (property-wide) Limited-edition Walt Disney World Millennium Celebration designs. Music: A dramatic original music score composed by Gavin Greenaway and supervised by Hans Zimmer, Oscar-winning composer for Disney's "The Lion King." Recorded by a 71-piece philharmonic orchestra and a 30-voice chorus. Costuming: The Tapestry of Nations puppets will arrive dressed in one-of-a-kind ensembles designed by Michael Curry, whose production credits include Disney's "The Lion King on Broadway."